La Manga Club is surely one of Europe’s finest golfing destinations with 3 championship courses, each offering its own distinctive style and terrain. First class practice facilities, which include a renowned golf academy, 80 bay driving range, chipping and putting greens, as well as an 18 hole par 47 pitch and putt course. 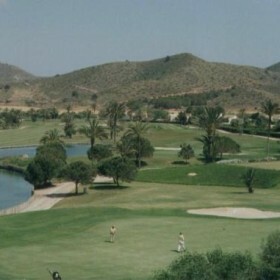 Designed by Robert D. Putman in 1971 and remodelled by Arnold Palmer in 1992, La Manga Club’s famous South Course has undergone complete refurbishment. The main changes involve more water being brought into play, more tree planting – which will affect the overall playing strategy on the course – as well as considerably more movement on the greens. Coupled with the re-positioning of a number of tees, these improvements make for a more modern course lay-out, which will above all, provide a more interesting examination for the discerning golfer. 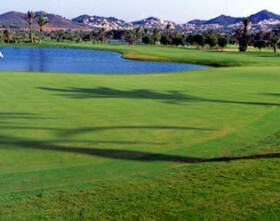 The South is La Manga Club’s classic championship course and is probably one of the fairest tests of golf one can find. At 6,499 metres from the white tees, whilst being accepted as a top-calibre championship course, the South Course also provides a thorough test for players of all levels, from the scratch player right across the handicap range. Located in the centre of the valley, with wide palm-fringed fairways and water hazards that come into play on 15 of the 18 holes, the South Course holds few hidden dangers. 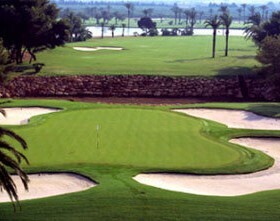 Its many strategically positioned water hazards and bunkers will certainly punish any wayward shots. The front nine are particularly tough, with two par 3’s over 200 metres and some daunting par 4’s which will demand accurate driving between lakes and bunkers, requiring long irons or fairway woods to the green. The back nine, although shorter, has a number of intriguing dog-leg holes. Special attention should be given to both the 11th and 12th holes, which demand precise club selection to greens across water. The large waste area on 14 will provide “food for thought” for most players, and is followed by the par 4, 15th, which fully justifies its stroke 1 rating. The new stream bordering the 16th Green feeds a newly constructed lake protecting the front of the green, which will require 100% concentration from all golfers. The par 5 18th, with water on both sides of the fairway and a ravine just short of a well-protected green, will prove to be a particularly stern finish. Also designed by Putman, the North has just undergone complete refurbishment, which, amongst other improvements, has created more interesting greens with much more movement. More undulating than the South, the North offers a different, yet no less challenging round of golf. Relying on precision rather than length, an added challenge is provided by the barrancas or storm gullies that snake their way through the course. This Dave Thomas designed course is set amid pine woodlands and presents frequent changes in elevation. This is a deceiving course that demands the occasional blind shot, where a tight front 9 contrasts with a more open, but nonetheless challenging back 9.